Clown plays music like Chicken Dance, Hokey Pokey etc. Plays more games such as Limbo, hot potato, tic tac toe, clothes pins in bottle. Makes balloon animals and does face painting. Special prize for the birthday child! 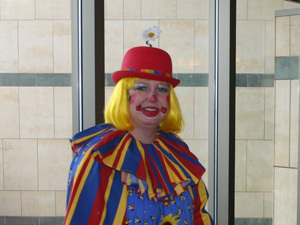 Clown plays a couple of dance signs, performs a few pocket tricks, makes balloon animals and simple face painting. Special prize for birthday child! 30-40 minute magic show, a little sillier than a magician. Tries to have as many helpers as possible. Make balloon animals. Birthday child helps to do first magic trick and gets to keep the prize.